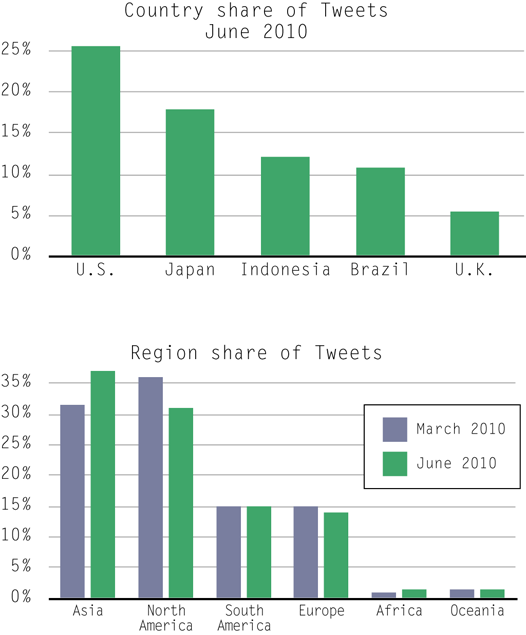 A recent study from Semiocast, a Paris-based company, revealed Asia as the region where most tweets were originated. The region produced 37% of global tweets, a 6.5% increase compared to previous measure taken three months earlier. North America region trailed at the second position with 31% of global tweets, a 5% decrease compared to 36% share it took in the previous measure. Besides dominating the global tweets, the study also highlighted Asia as the region with the fastest growth of tweets. The results were obtained by analyzing tweets over the period of 24 hours on June 22nd, 2010. By extracting the language in the tweet combined with processing geotag information in the tweet header, all tweets were then mapped to produce the country and region distribution. In the previous measure conducted in March 2010, one-week tweets gathered from March 21 to March 28, 2010 were used in the analysis. At the country-wise, US still topped worldwide tweets with approximately 25% share. The percentage was a 5% decline from 30% share it gained in the previous measure. Asian countries like Japan, Indonesia, and South Korea steadily grew in number of tweets. Japan was accounted for 18% share while Indonesia and South Korea secured 12% and 2% of global tweets. The percentages for the three Asian countries had been a rise compared to their previous shares. Below, two figures describing the results of the study are provided to better reflect the statistics. The figures are the property of Semiocast. The geographical distribution of tweets presented in this study may provide some insights for companies planning to expand in Asia market. The popularity of social applications like Twitter and Facebook may drive the companies to find new creative ways in reaching the target customers in Asian market. With the viral effect contained in a popular tweet message, companies may devise new marketing propaganda to attract the customers. The study was published in early July this year and the detailed report of the findings was made available at the company’s website. This entry was posted in Miscellaneous and tagged social media on August 3, 2010 by Tech Admin.